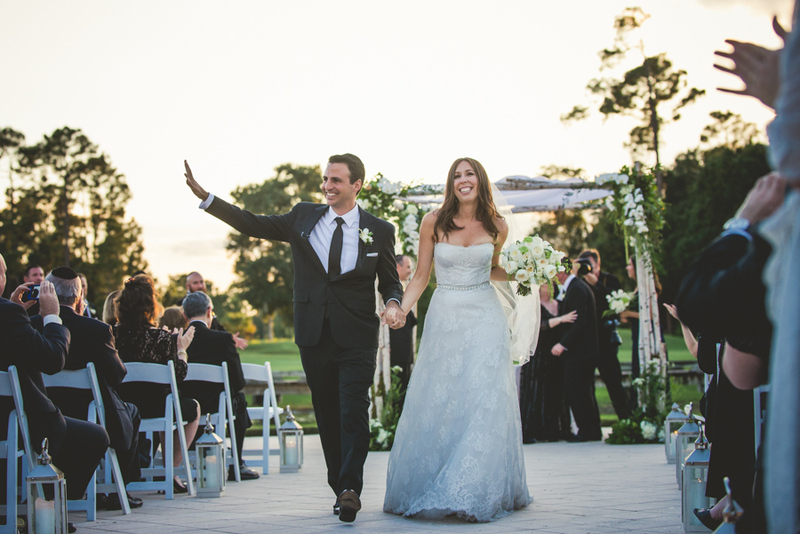 Marcie and Matt tied the knot at The Waldorf Astoria in Orlando, Florida. 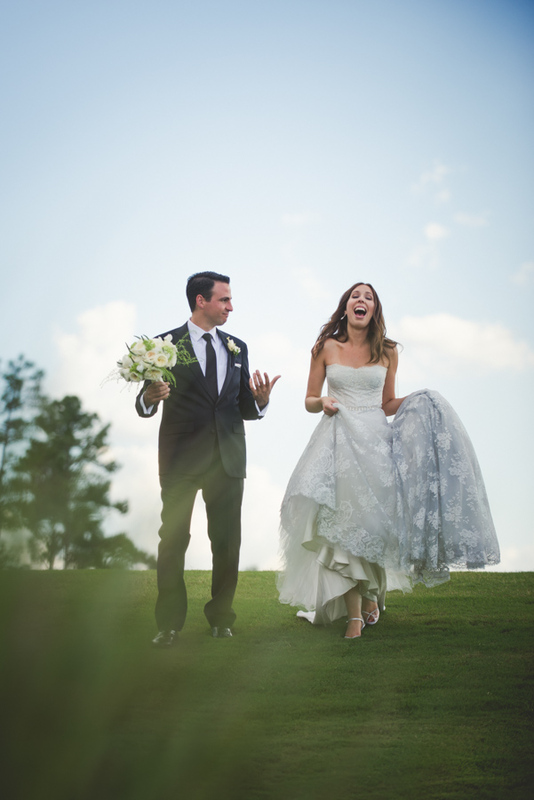 Extraordinarily elegant and contemporary describes their wedding as they celebrated the big day with a traditional Jewish ceremony outside, followed by a splendid ballroom reception. 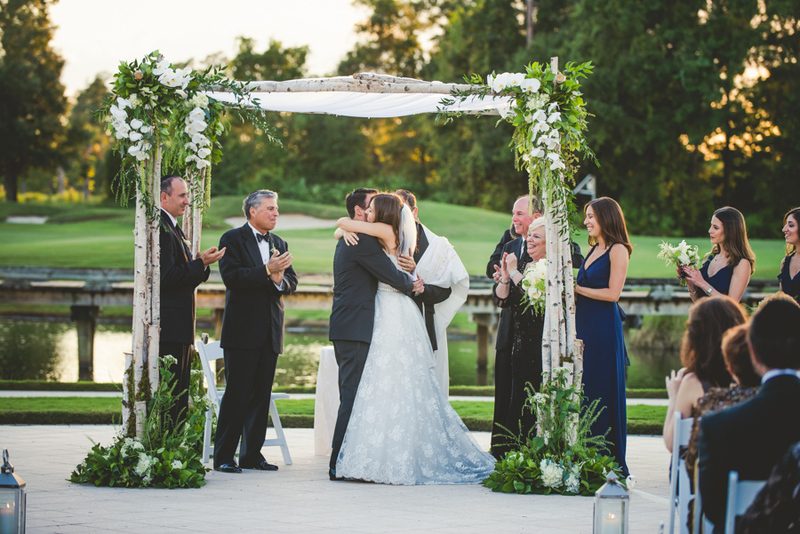 Marcie and Matt stuck to tradition as they requested to have a Chuppah (or Huppah) hovering over them as they exchanged their vows. 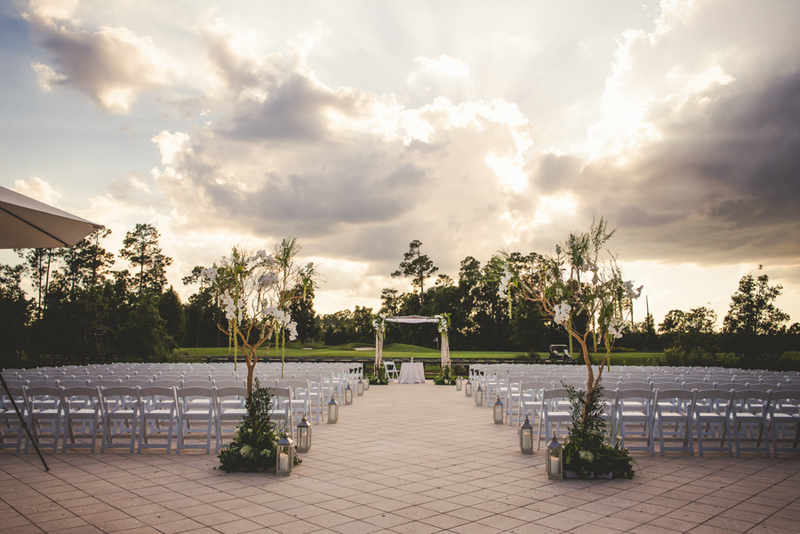 The guests were greeted by the two tall entrance arrangements that were actually trees which complimented the grandeur of the Chuppah. 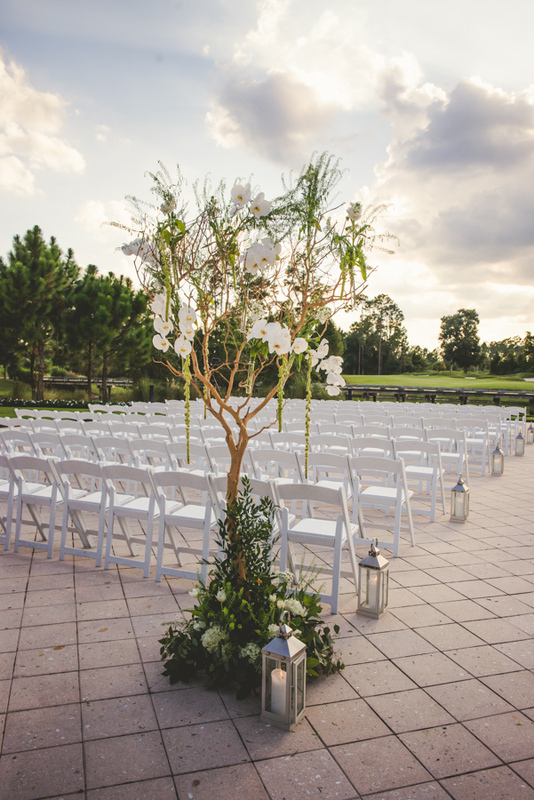 The aisle was decorated with lanterns that set a warm, romantic feel to the overall ceremony. 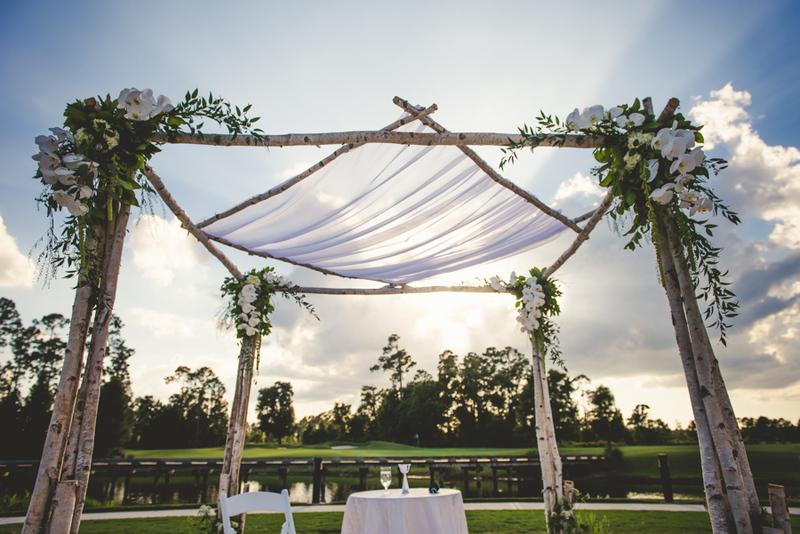 The Chuppah’s structure was built with birch branches and each corner was embellished with beautiful floral decor. 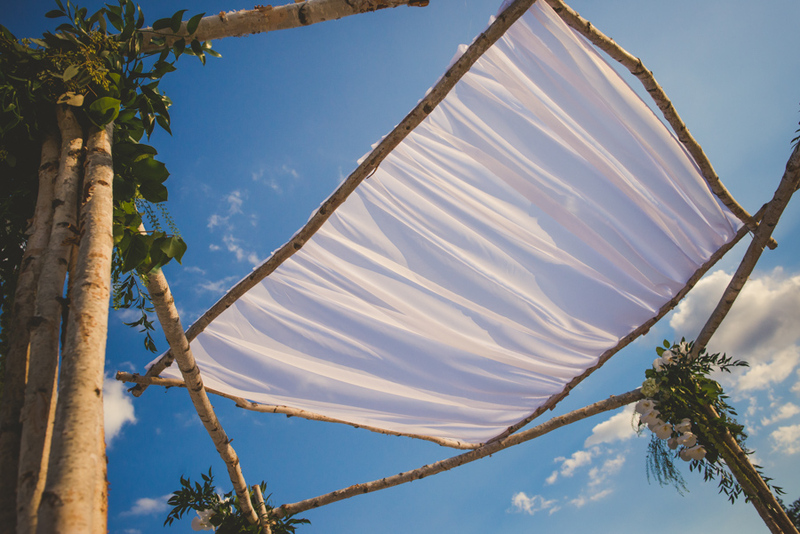 The Chuppah was covered with a sheer drape, intended to cover the Bride and Groom during the ceremony. One of the grand entrance arrangements of a tree decorated with green and white flowers. So pretty! 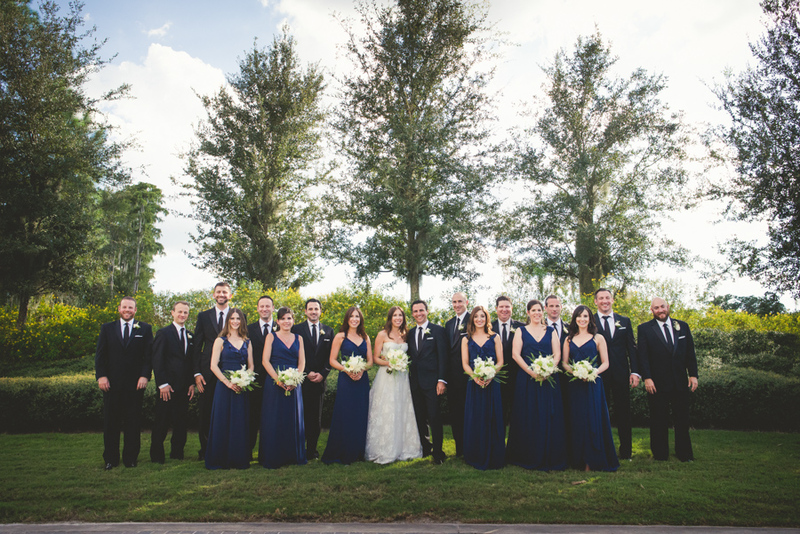 The bride, the groom, the bridesmaids, and ALL of the groomsmen. Such a great looking party. Marcie and her bridesmaids looked amazing. The bridesmaids bouquets consisted of white roses, sweet pea, astillbe, green mini hydrangeas, explosion grass, anemones, white veronicas, and hypericum berries. 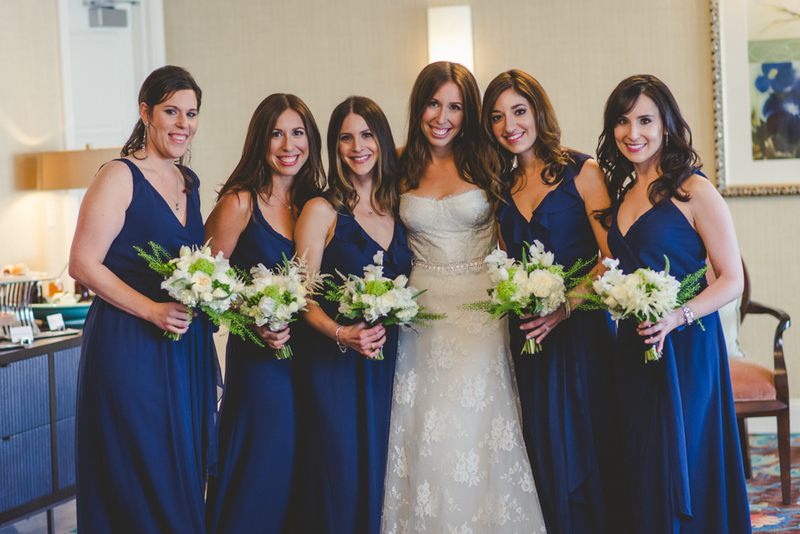 The whites and greens definitely complimented their deep blue dresses! 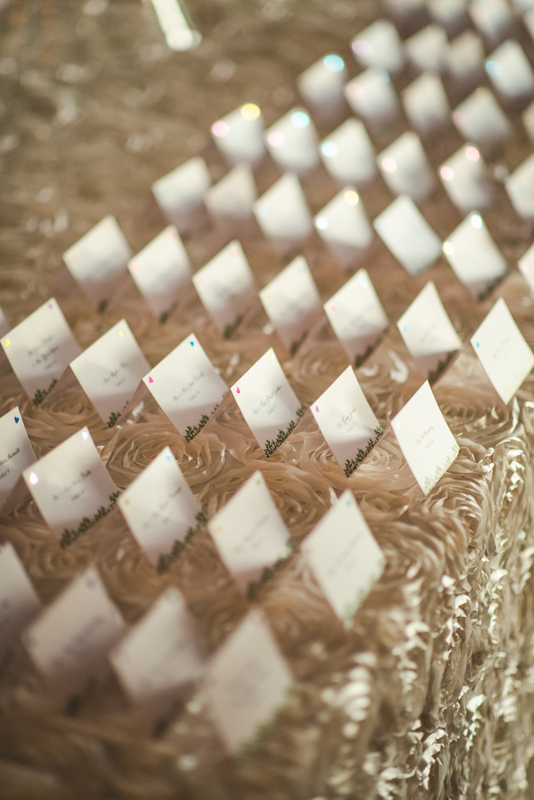 Their card table was decorated with specialty linen that added a lot of texture to it. 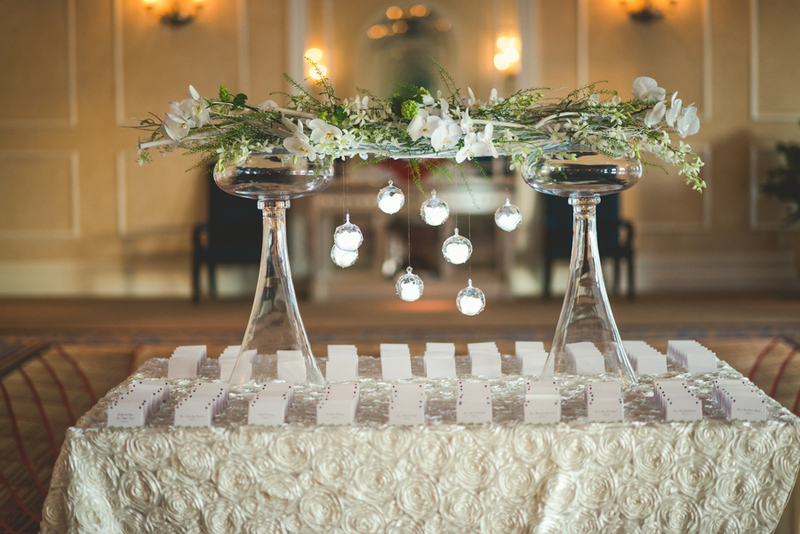 The table was topped with a uniquely designed arrangement of flowers on top of white branches with hanging globes that lit up. The reception room was just stunning. 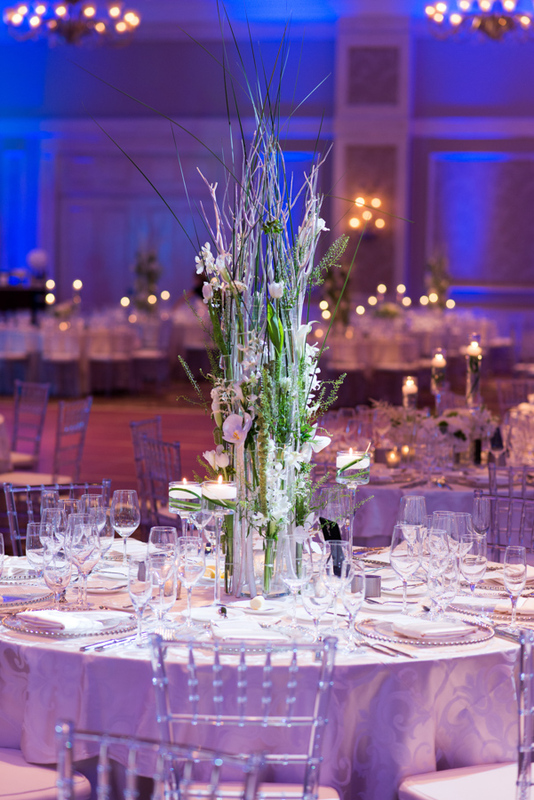 From the table linens to the unique centerpieces, to the clear chiavari chairs to the beaded glass chargers, it was nothing short of a perfect setting. 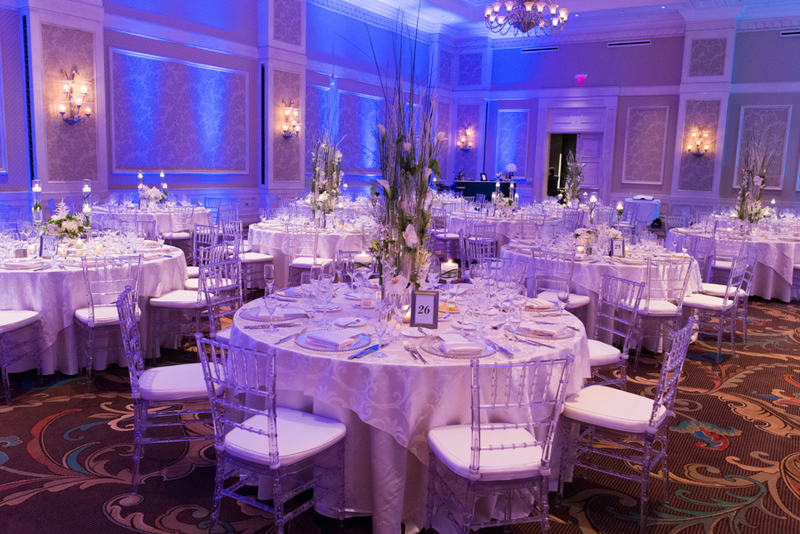 The blue uplighting gave the room a more “finished” look and set the ambience for the gorgeous reception. This unique piece looks very minimalist and pays such close attention to every little detail. 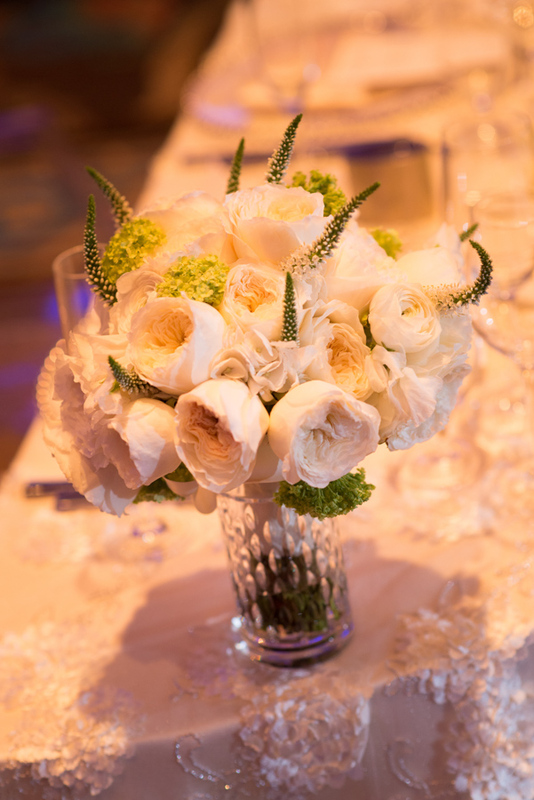 Each and every flower stem is showcased outwardly in this centerpiece, instead of bundled up inside of the vase. 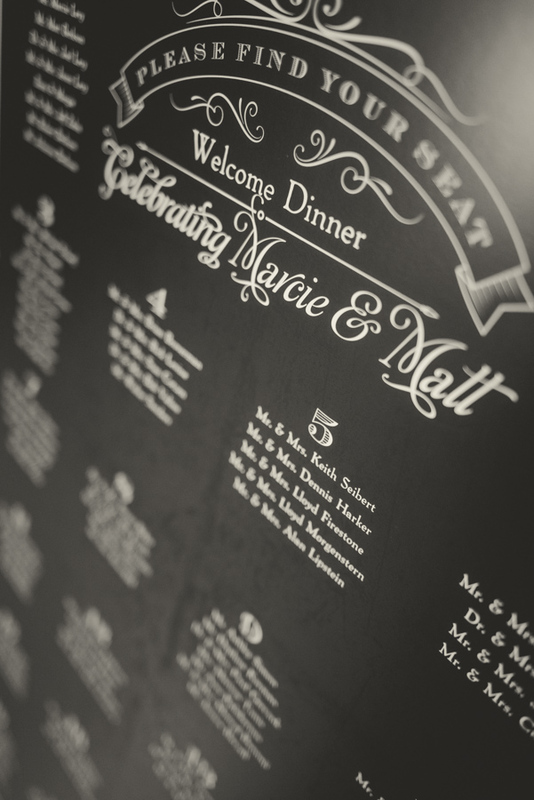 Marcie and Matt were super impressed with the design and we were so excited to be able to be creative for them! 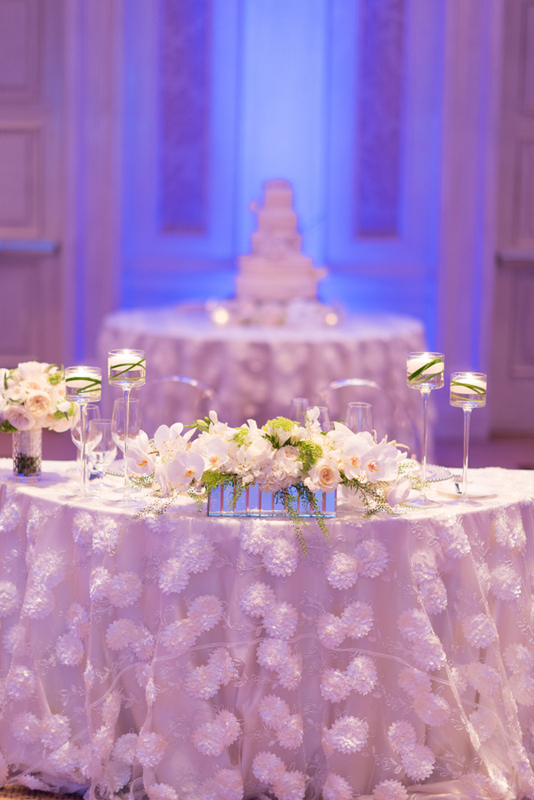 Here’s an aerial view of a low-centerpiece reception table. You can see the ivory napkins placed on top of the beaded glass chargers. 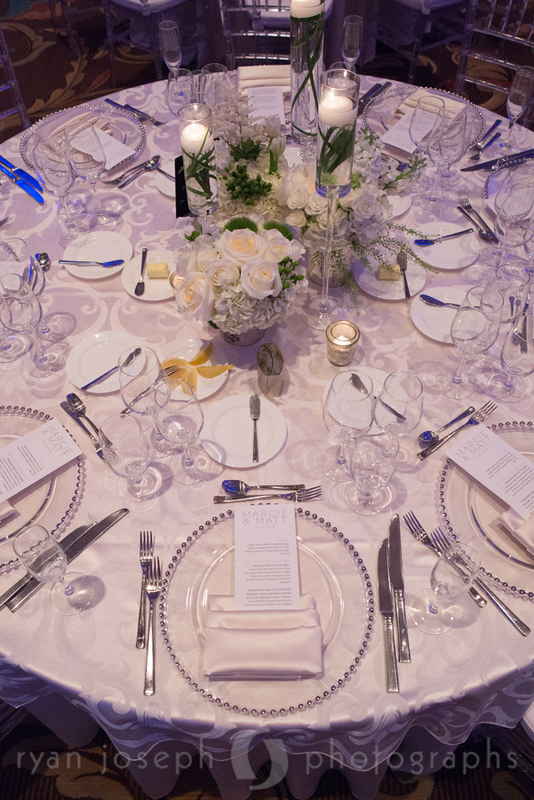 The table linen was visible through the glass chargers and all of the glassware just made the table look so elegant. 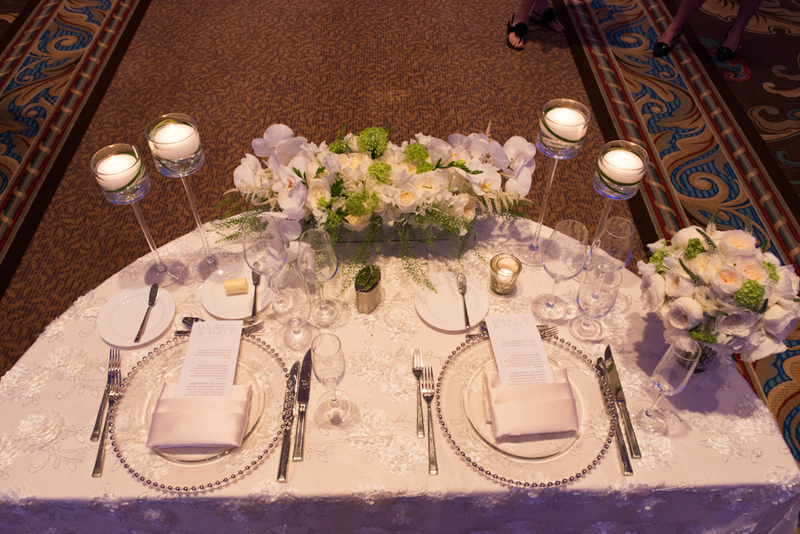 Each of the tables had candle stems with floating candles, all different heights, to create some depth to the table. Marcie and Matt’s sweetheart table. It was a half-crescent moon table that was decorated with a low and long floral arrangement that sat on the front end of the table. Marcie chose a lace overlay- different from the rest of the guest tables- which is a great idea to set the Bride & Groom apart from the rest and to make it more special for the two of them. Marcie used her bridal bouquet to place on her sweetheart table as part of the table decor. Her bouquet had all white garden roses, white ranunculus, white veronicas, sweet pea, and green mini hydrangeas. Absolutely gorgeous! The view of the sweetheart table from the guests’ perspective. 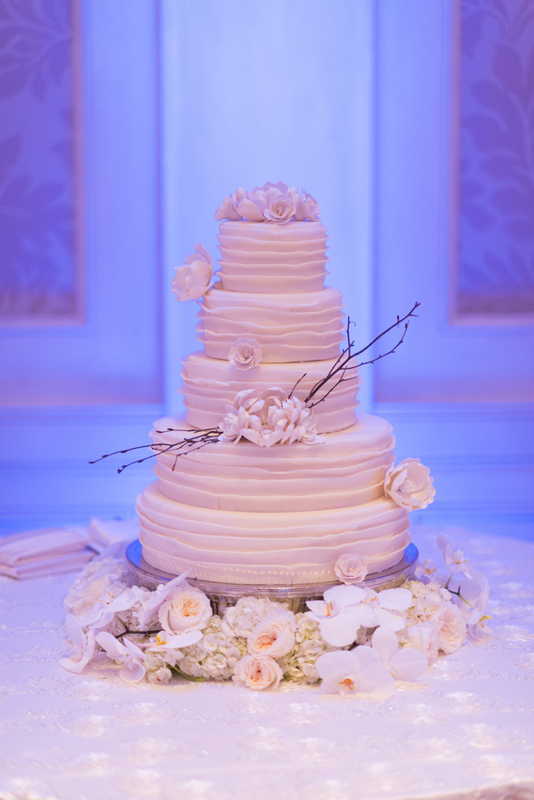 The cake table also had specialty linen and overlay as well as cake decorations at the bottom of the cake. 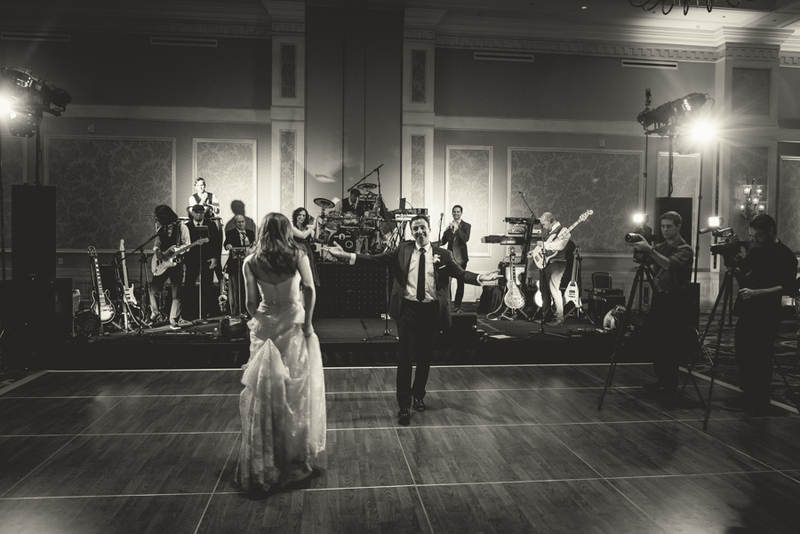 The couple’s first dance… so classy. So loving. The Bride & Groom sitting at their sweetheart table, facing the band. 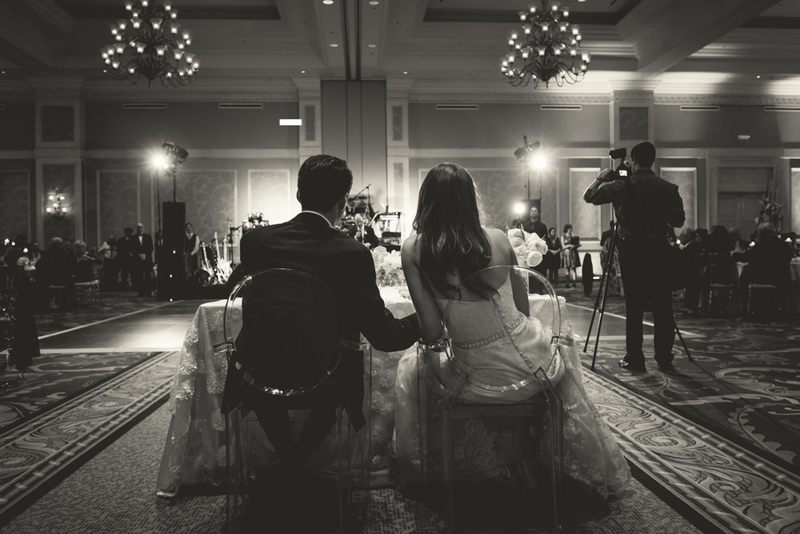 You can see all the details of her dress through the clear ghost chairs… As they sit side by side, nearing the end of the their wedding celebration and starting the beginning of their life together as one!